Absolute Online Estate Sale Auction - Regardless of price, every item sells to the high bidder. No minimums. No reserves. 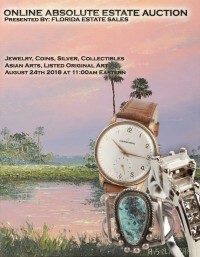 Register & bid now on 600 lots: Fine Gold Estate Jewelry, Diamonds, Sterling Silver Jewelry, Coins - Gold, Silver & Proof Sets, Currency / Paper Money, Watches & Clocks, Sterling Silver Flatware & Holloware, Estate Costume Jewelry, Asian / Chinese Arts, Carved Soft Stones, Carved Chinese Jade, Art, Original Florida Highwaymen Paintings, Original Oil Paintings, Memorabilia, Statuary, Pottery, Glassware, Porcelain, Crystal, Native & Ethnographic Collectibles, Military & Wartime Memorabilia & Estate Collectibles. This comprehensive online estate auction offers an extensive assortment of quality estate personal property - consigned by estates throughout the United States. Online Only Estate Auction. Pre-bidding is Open Now - Register & Start Bidding. 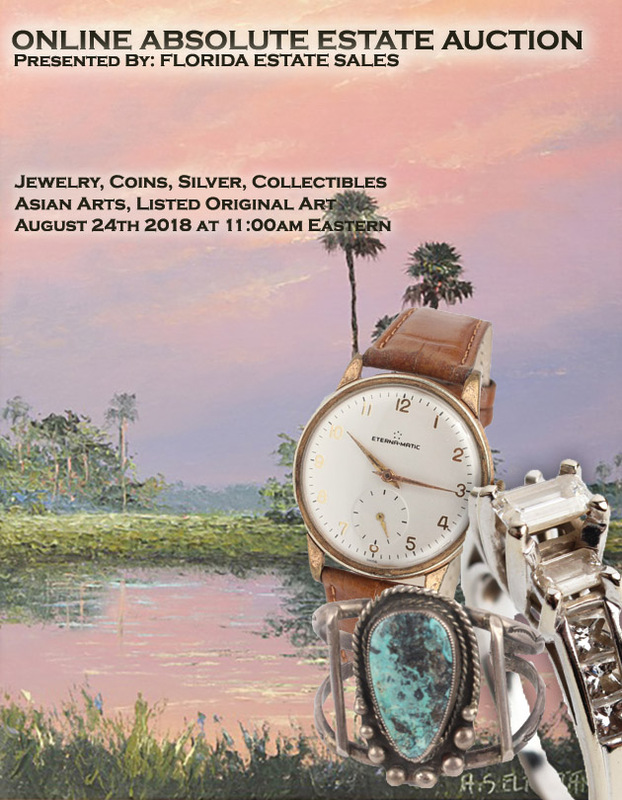 Live Auction Webcast (Live Real-Time Online Bidding) Begins at 11:00am Eastern on Friday, August 24th 2018. 7 STERLING SILVER ITEMS COMPOTE LIGHTERS ETC. 5LBS+ LADIES & MENS COSTUME JEWELRY WATCHES ETC. PAIR FLORIDA OIL PAINTINGS ON BOARD SIGNED "TODD"
FLORIDA OIL PAINTING OF BASS FISH SIGNED "TODD"
FLORIDA OIL PAINTING OF CYPRUS TREES SIGNED "TODD"
PAIR FLORIDA OIL PAINTINGS AT DUSK SIGNED "TODD"
COMMEMORATIVE TOKENS, PAPER MONEY, COINS, ETC.